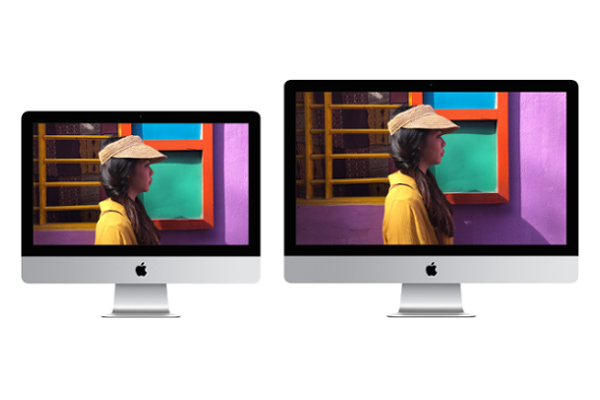 APPLE releases 27-inch iMac with Retina 5K display and 21.5-inch iMac with Retina 4K display. Apple today updated its iMac line with up to 8-core Intel 9th-generation processors for the first time and powerful Vega graphics options. This boost in performance, combined with Retina display, all-in-one design, fast storage and memory, and macOS Mojave. The 21.5-inch iMac now features 8th-generation quad-core, and for the first time 6-core processors, delivering up to 60 percent faster performance. The 27-inch iMac now for the first time features up to 9th-generation 6-core and 8-core processors, delivering up to 2.4 times faster performance. Radeon Pro Vega graphics come to the 21.5-inch iMac for the first time, delivering up to 80 percent faster graphics performance. The 27-inch iMac with Radeon Pro Vega now delivers up to 50 percent faster graphics performance, ideal for pros with graphics-intensive workloads, such as developing 3D content, editing videos with complex effects or designing high-resolution games. With up to 14.7 million pixels, 1 billion colors, 500 nits of brightness, P3 wide color gamut and an incredible viewing angle, iMac's Retina 4K and 5K display delivers an immersive front-of-screen experience. All these pixels result in text that looks like a printed page, sharper photos with more detail, and the ability to edit 4K video at full resolution. With its sleek aluminum and glass enclosure, 5 millimeter-thin profile and beautiful matching keyboard and mouse, iMac delivers a clean and uncluttered desktop experience. All new Macs come with macOS Mojave. macOS Mojave also brings iOS apps, including News, Stocks, Voice Memos and Home to the Mac and features a redesigned Mac App Store with rich editorial content and the addition of apps from top developers, including Microsoft and Adobe. The new 21.5-inch iMac with Retina 4K display starts at $1,299 (US) and the new 27-inch iMac with Retina 5K display starts at $1,799 (US). The non-Retina display iMac configuration continues to be available for $1,099 (US). Both are available to order starting today from apple.com and the Apple Store App, and in Apple Stores and through Apple Authorized Resellers next week.